BALORAY LUNCH BAG-Quality life starts with simple stylish striped design. Light weight,padded handle,upgraded duarable smooth zipper,easy to clean, waterproof, Insulated ,cooler,convenient. If you have any questions with our proudct, please contact with us by email, we will solve it for you within 24 hours. 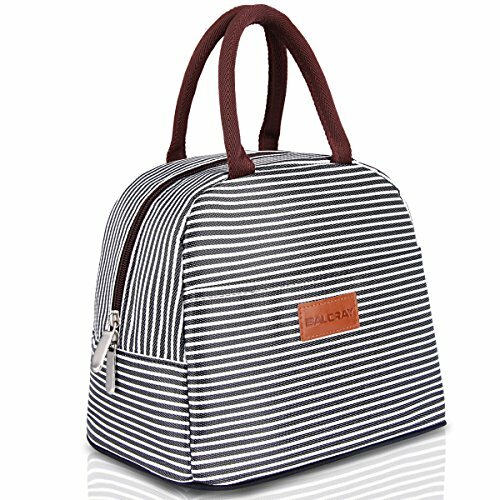 BALORAY LUNCH BAG-Quality life starts with simple stylish striped design.This lunch bag can be used as lunch bag, picnic bag, sundry bag, suitable for all groups,include men,women,girls,boys and kids. Standard lunch bag Size:9.64x 6.5x 8.45 inch.This lunch bag looks small but with large capacity, it could perfectly fit your lunch box, snacks, and even protein shake bottle.This is the honest feedback from our customers. High Quality Material:Durable oxford cloth and nontoxic aluminum foil( BPA FREE), perfect to pack your food and lunch containers.We have upgraded Insulation lined interior based on your needs. It will keep your food cold or warm for about 4 hours. More Features: Light weight,padded handle,upgraded duarable smooth zipper,easy to clean, waterproof, Insulated ,cooler,convenient.One front pocket design organize your napkin and personal stuff, such as your phone,bus card,tissue,ect. BALORAY Lunch Bag Guarantee: If you are not 100% satisfied with our lunch bag,we offer you 30 days refund or replacement. If you have any problem,please contact with us by email, we will solve it for you within 24 hours. If you have any questions about this product by BALORAY, contact us by completing and submitting the form below. If you are looking for a specif part number, please include it with your message.